Alternative energy. Biophysics. Entrepreneurship. Choose your path. Starting with your first semester you will work in the lab to deepen your understanding of physical properties. Through honors-level first-year courses, you will start to familiarize yourself with faculty research in cutting-edge labs. A Bachelor of Science in applied physics from Michigan Technological University will provide you with the educational momentum you need to succeed in this highly competitive field. Our students learn best by doing, which is why we emphasize challenging lab work and rewarding research. Get involved in research. Undergraduate students have opportunities to work with faculty on a variety of research projects. Students are paired with a faculty member for a minimum of two semesters of research, but students frequently exceed this degree requirement by taking advantage of the department's many opportunities for continued research. We take pride in providing hands-on education; undergraduate research experiences are just one of the many teaching-learning experiences in our program. The physics department prides itself on a sense of collegiality. This comes not only from faculty-student mentoring but also peer-to-peer support. With such a small undergraduate community (typically 25 students per incoming class), students quickly become an integral part of the department's culture. Students are exposed to many disciplines within physics throughout their undergraduate career, which greatly increases post-graduation success. Physics students inside the European Laboratory for Particle Physics; Geneva, Switzerland, CERN. Students broaden their degree experience by working directly with the physics department staff and faculty. Opportunities include working as an academic coach to students in the Physics Learning Center, design and execute real-world, textbook concept demos for classrooms on the Demonstration Crew, become a teaching assistant in labs, and work side-by-side with faculty on cutting-edge research projects. 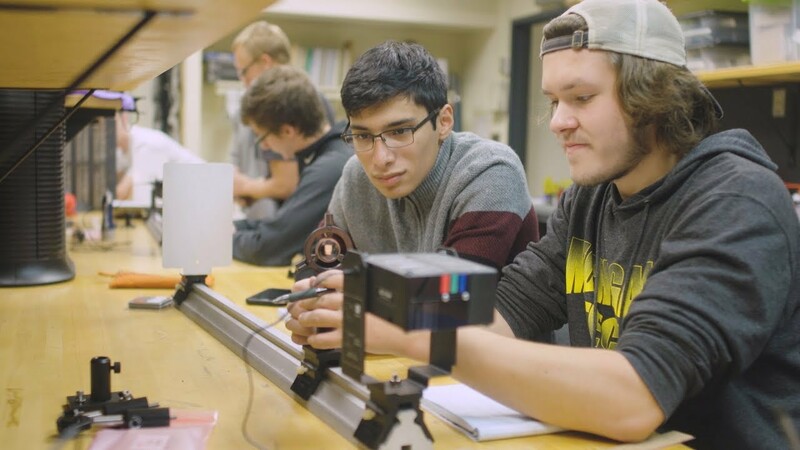 First-year physics students automatically become members of the Michigan Tech chapter of the Society of Physics Students—a national professional organization designed to help students develop into successful members of the professional physics community. The Bachelor of Science in applied physics is intended for students pursuing a career in physics or closely related fields. While this career path typically includes graduate studies, it can also lead to a variety of careers in technical areas in industry and government.